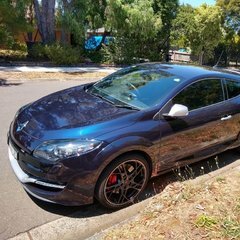 I have just put a deposit on a RB8 Megane RS - car is a mint example -one owner, full Renault history, super low KM's, etc. 1. With the engine idling, a rattling noise can be heard when gently blipping the throttle. This vanishes as soon as the revs increase. Any ideas?? 2. Oil on top of the cam cover (underneath the main cover that sits on top of engine) - it could be the somebody spilt oil when filling and its run onto the top?? No oil underneath car. Just sold a Focus XR5 Turbo to buy this - The Megane does not feel as quick during acceleration, but i bought it for the cornering ability and braking power. Owned two 5 GT Turbos and a 19 16 Valve back the the UK. Found heat shield clips missing on mine, the shield over laps and sits over Mid Muffler & up to rear of engine. ^^ what they said. Alternatively, in my case there was a leak from a line somewhere around the top of the engine - can't recall exactly what or where this was so apologies for the vagueness, but it was easy for the mechanic to find and $100 to fix. A little surprised you found the Meg slower than the XR5 given it's got more power, more torque, and less weight. Was the XR5 modified? Did you have the Meg in Sport mod for full output? If not is it possible it's not in full health? Thanks for all your replies - I went back and checked out the car again, i could not recreate the noise! Glad the oil leak is nothing serious - I guess the current owner will need to have this fixed for the roadworthy, or the mechanic will just clean the oil off. One thing that is disappointing, despite having a full main dealer history the car has not had the timing belt done. I have read its every 4 years or 100K which ever comes first. Car is late 2013 with 28000 kms of the clock. I spoke with the service dept where the car had always been serviced, they did not acknowledge the 4 year interval. Odd. So the XR5 I have sold was around 320 BHP, so quite heavily modified. Hence the Megane feeling a bit slower. You'll miss that 5-cylinder donk though.